“By far the most interesting member of the legislature was the speaker, Henry J. Raymond,” wrote Chauncey M. Depew, who was a freshmen member of the State Legislature in 1862. 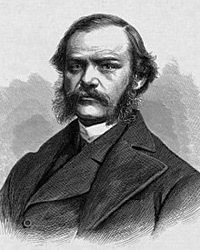 The Governor of New York at the time, Edwin D. Morgan described Raymond as “the Speaker of the Assembly as is quite apparent to all who read the debates of that body.”1 Raymond served as speaker during the 1862 session — as he in the early 1850s. Raymond was not, however, the undisputed leader of the body — having to contend with others whom he had defeated to be elected Speaker. And even his prodigious powers of public speaking did not ensure that his views prevailed on issues like taxation and harbor defenses. Raymond “had occasion more than once to display not only moral but physical courage in defense of his principles,” wrote Elmer Davis, in History of The New York Times. 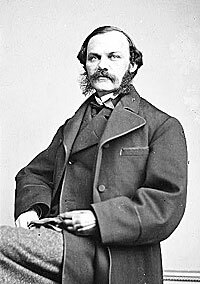 “As a reporter and editorial writer he was remarkably gifted; his writing was rapid, his style clear; a rare virtue in those times, his copy was legible.”11 He had been a young assistant of Tribune Editor Horace Greeley and went on to work for the New York Courier and Express before founding the Times in 1851. A Whig activist, he became a Republican stalwart and served as speaker of the New York State Assembly. He was a former Lieutenant Governor of New York, whose nomination to that post in 1854 infuriated Greeley, who thought he had a prior claim to it and who broke off relations with Seward and Weed as a result. “The editor was a good journalist and the newspaper was a good newspaper, but together they never quite clicked. One of the problems was Raymond’s ambitions for public office; they interfered with his duties at the paper. The other problem, and probably a bigger one, was his dithering; he always had trouble making tough decisions. Maybe it was all part of the fact he was such a political animal,” wrote James M. Perry. “He was the kind of man his rivals loved to poke fun at. They had a field day when Raymond set out to cover the war at Bull Run in person.”12 Unfortunately for Raymond, Army censors prevented most of this reporting from being transmitted back to the New York Times for publication. According to Waugh: “Raymond was one editor Lincoln could be grateful for. He liked the president, supported him, defended him, wheeled his big, high-toned newspaper along the same policy path — and understood politics so well that he was a leader in Lincoln’s own Republican party, a prominent figure in its birth in 1856.”19 In mid-December 1860, President-elect Lincoln responded to a letter from Raymond that enclosed a letter from a Mississippi resident containing a series of allegations about a September 1859 trip which Mr. Lincoln made to Ohio to make political speeches. Yours of the 14th. is received. What a very mad-man your correspondent, [Vicksburg, Mississippi resident William C. Smedes is. Mr. Lincoln is not pledged to the ultimate extinctinction [sic] of slavery; does not hold the black to be the equal of the white, unqualifiedly as Mr. S. states it; and never did stigmatize their white people as immoral & unchristian; and Mr. S. can not prove one of his assertions true. Mr. S. seems sensitive on the questions of morals and christianity. What does he think of a man who makes charges against another which he does not know to be true, and could easily learn to be false? As to the pitcher story, it is a forgery out and out. I never made one speech in Cincinnati — the last speech in the volume containing the Joint Debates between Senator Douglas and myself. I have never yet seen Gov. Chase. I was never in a meeting of negroes in my life; and never saw a pitcher presented by anybody to anybody. Your name, with others, has been handed me as having been employed by the government in furnishing supplies to the medical department of the army during the past year. I take it for granted you appreciate the necessity of sustaining the government in its contest with the rebellion, and of electing the Union candidates in November, the only mode of carrying the war to a successful close, and of restoring a peace which shall also restore the Union. Mr. Seward sent me to-day some strange documents from Raymond, Chairman of the National Executive Committee. I met R. some days since at the President’s with whom he was closeted. At first I did not recognize Raymond, who was sitting near the President conversing in a low tone of voice. 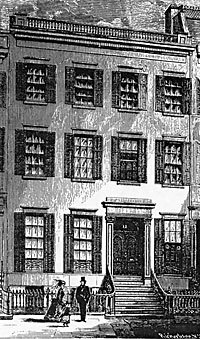 Indeed, I did not look at him, supposing he was some ordinary visitor, until the President remarked, ‘Here he is; it is as good a time as any to bring up the question.’ I was sitting on the sofa but then went forward and saw it was Raymond. He said there were complaints in relation to the Brooklyn Navy Yard; that we were having, and to have, a hard political battle the approaching fall, and that the fate of two districts and that of King’s County also depended upon the Navy Yard. It was, he said, the desire of our friends that the masters in the yard should have the exclusive selection and dismissal of hands, instead of having them subject to revision by the Commandant of the yard. The Commandant himself they wished to have removed. I told him such changes could not well be made and ought not to be made. The present organization of the yard was in a right way, and if there were any abuses I would have them corrected. With his election to Congress and the death of President Lincoln, Raymond’s political and journalistic careers moved into eclipse. As chairman of the Republican National Committee, Raymond thought it was his duty to support President Andrew Johnson and the National Union Convention in Philadelphia in 1866 that had been called to unite his supporters from the North and South. Raymond’s support cost him his party chairmanship and cost The Times thousands of dollars in subscription revenues. James A. Rawley, Edwin D. Morgan, 1811-1883: Merchant in Politics, p. 172 (Letter from Edwin D. Morgan to Thurlow Weed (February 9, 1862)). Chauncey M. Depew, My Memories of Eighty Years, p. 21. Augustus Maverick, Henry J. Raymond and the New York Press for Thirty Years, p. 223. Elmer Davis, History of The New York Times, 1851-1921, p. 71. Roy P. Basler, editor, The Collected Works of Abraham Lincoln, Volume VII, p. 360 (Letter to E.A. Paul, May 24, 1864). Gideon Welles, Diary of Gideon Welles, Volume II, p. 87-88 (July 26, 1864). Gideon Welles, Diary of Gideon Welles, Volume II, p. 104 (August 13, 1864). James M. Perry, A Bohemian Brigade: The Civil War Correspondents, p. 55. Andrew A. Freeman, Mr. Lincoln Goes to New York, p. 70. Herbert Mitgang, editor, Spectator of America: A Classic Document About Lincoln and Civil War America by a Contemporary English Correspondent, Edward Dicey, p. 28. Elmer Davis, History of The New York Times, 1851-1921, p. 14. James M. Perry, A Bohemian Brigade: The Civil War Correspondents, p. 56. Elmer Davis, History of The New York Times, 1851-1921, p. 50-51. Elmer Davis, History of The New York Times, 1851-1921, p. 51. Charles M. Segal, editor, Conversations with Lincoln, p. 235-236 (from Henry J. Raymond, ‘Extracts from the Journal of Henry J. Raymond,’ Scribner’s Monthly, March, 1880). Harry J. Carman and Reinhard H. Luthin, Lincoln and the Patronage, p. 262. John Waugh, Reelecting Lincoln, p. 140-141. John Waugh, Reelecting Lincoln, p. 141. Roy P. Basler, editor, The Collected Works of Abraham Lincoln, Volume, IV, p. 156 (Letter to Henry J. Raymond, December 18, 1860). James G. Randall, Lincoln the President: Last Full Measure, p. 367. James G. Randall, Lincoln the President: Last Full Measure, p. 293. Noah Brooks, Washington in Lincoln’s Time: A Memoir of the Civil War Era by the Newspaperman Who Knew Lincoln Best, p. 146. David E. Long, The Jewel of Liberty, p. 124. James G. Randall, Lincoln the President: Last Full Measure, p. 252. Reinhard H. Luthin, The Real Abraham Lincoln, p. 539. Gideon Welles, Diary of Gideon Welles, Volume II, p. 97-99 (August 8, 1864). Gideon Welles, Diary of Gideon Welles, Volume II, p. 109 (August 17, 1864). Gideon Welles, Diary of Gideon Welles, Volume II, p. 112 (August 19, 1864). Augustus Maverick, Henry J. Raymond and the New York Press for Thirty Years, p. 169.